— Mother Mary Angelica, P.C.P.A. Use holy water upon awakening in the morning, as well as when entering or leaving a church or a house of the Community. Carry a container of holy water during the entire day, until retiring at night. When entering a church or a house of the Community, always visit the Blessed Sacrament; do the same when leaving. If entering and leaving many times in a day, it is sufficient to visit the Blessed Sacrament upon the first entry and the last exit, as well as before retiring in the evening. Also, visit an image of Our Lady. The period of silence begins at 9:30 p.m. and continues until 7:00 a.m. the next morning. The communal recitation of at least Morning and Evening Prayers of the Liturgy of the Hours, the two hinges upon which the daily Office rotates, by those who live in community is very praise worthy, because it constitutes a fountain of Christian life, being a source of piety and nourishment for personal prayer. It is a House custom to recite a prayer to the Divine Child Jesus daily. “I conjure you all to show all reverence and all honor possible to the most holy Body and Blood of our Lord Jesus Christ, in whom the things that are in Heaven and the things that are on earth are pacified and reconciled to Almighty God.” — St. Francis of Assisi. Jesus is the Eucharistic King whom the Knight of the Holy Eucharist has pledged himself to serve and to defend. As a loyal Knight, he willingly lays down his life not only for Him but also for all that is His. It is for this reason that his protection and service extends to His holy Temple. One of the primary focuses of the Knight’s service is the fostering of reverent devotion to Our Lord in the Most Blessed Sacrament. Called to serve at the Mass, the Knight gives public witness to the profound reverence and devotion befitting such sacred service. Those who have given themselves over to God find themselves repaid a hundredfold (cf. Matthew 19:29), sometimes in earthly blessings, but always in an abundance of grace. As a sign of respect and adoration, it is indispensable to prepare oneself before receiving Our Lord in the Eucharist. This preparation should not be hurried, but rather of sufficient length to recollect the spirit, free the mind of any agitation, and place it in the anticipation of receiving Our Lord in the Sacred Host. If possible, the Knight is to daily partake of the Holy Eucharist. 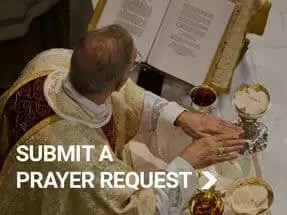 On days when it is not possible to receive Communion sacramentally, he should make a spiritual communion with thanksgiving of at least ten minutes, kneeling on both knees, except in case of sickness or some other impediments. End the thanksgiving with a prayer before an image of Our Lady. For personal perseverance and confirmation in grace; for progress in the spiritual life, especially regarding the virtue of purity. If possible, the Knight is to daily participate in the liturgy, the sacred action par excellence, since it is the work of Christ the Priest, and of His Body, which is the Church, and whose efficacy is not equaled by any other ecclesial action. He should receive with great frequency the same sacrifice, the Body of the Lord, the spiritual sustenance in which is contained all the good of the Church. It is a custom to pray this Rosary for the repose of Mother Mary Angelica, the Ordinary and diocese in which we serve and for our living and deceased benefactors. The Knights should always seek to formulate intentions before praying the Rosary. Mary is the sure path to our meeting with Christ. Genuine devotion to the Mother of the Lord is always an impetus to a life guided by the spirit and the values of the Gospel. The Marian spirituality taught by St. Louis de Montfort and practiced by the Knights provides an easy, short, perfect and secure path to arrive in union with Our Lord. The Knight is to pray at least one rosary per day, preferably with the community. The Knight is to say five decades on his knees in the presence of the Most Holy Eucharist, or before an image of Our Lady, if in a place where the Blessed Sacrament is not present. 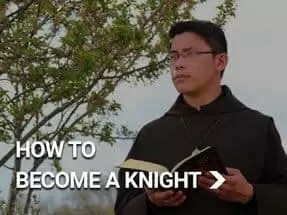 The Knight should carry a Rosary throughout the day, except during physical exercise or manual labor (if the Knight is using clothes without pockets). To learn to constantly contemplate with Mary the face of Jesus Christ, which is manifested in the beauty of creation and especially in the marvelous mystery of the Church, the Knight wears the Rosary hanging from his waist. The Knight is always to pray before and after meals. At breakfast, it is the House custom to pray an Our Father, a Hail Mary, and a Glory Be for our benefactors. Before eating something light (for example, a piece of cake or a sweet), it is enough to make the sign of the cross. Table conversation should elevate the mind and heart of the Knight to all that is good, true and beautiful. The Knights are to keep the elbows close to the body in order not to inconvenience your neighbor. Never rest the elbows on the table. Chew with mouth closed. Friday morning breakfast is eaten in silence. The knight should keep the eyes recollected and avoid looking at those around you. “In daily events, I must see the Providence of God. Remember this one little truth: Nothing happens to you without the stamp of His Providence placed upon it before it happens. That’s faith.” — Mother Mary Angelica, P.C.P.A. Time allotted for work will include various assigned tasks, talks, services, and scheduled adoration. Lunch is eaten according to schedule or with permission for individual convenience. As a means of representing the community, Knights are encouraged to wear their tunic when leaving the property. If Knights must leave the grounds for work-related reasons they may wear their work clothes, but these must be clean and presentable. Although offering hospitality may often prevent an exact observance of scheduled activities, this should not be seen as an infringement, but rather as a privileged opportunity to serve Our Lord in His ministers. Whenever possible, when something is found out of order (for example, furniture out of place or paper on the floor), each Knight should feel responsible to take the necessary measures to restore order, either personally or by telling the person in charge. A Knight of the Holy Eucharist seeks to manifest his love for Jesus not only in the faithful fulfillment of his daily responsibilities, but also, when an opportunity arises, by performing works of charity not specifically prescribed. In his free time, he may choose to bring comfort and companionship to the sick or the elderly or to assist the poor and underprivileged with whom he has contact. The Knight consumed with such holy fire will find in community life a place to pour himself out for others. “A man can have no greater love than to lay down his life for his friends” (John 15:13). “The Spirit speaks many languages, but perhaps the most important is the language of silence. You want to try speaking to God that way sometimes. Quiet your mind, stop thinking about what you must say and be still. Do nothing but realize for a few moments the essence of God. This language of contemplative silence can utterly annihilate you and sensitize you to the Presence of the Lord. 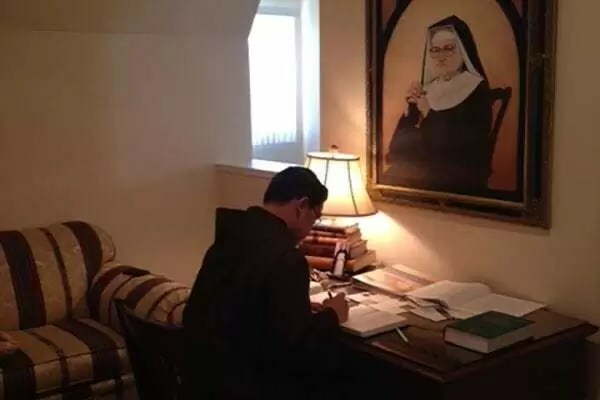 When the soul and spirit prostrate themselves before God, realizing their own nothingness, many words are heard, but not spoken.” — Mother Mary Angelica, P.C.P.A. Adoration times for individual Knights will be assigned. The Church, in its maternal zeal, recommends that Christians ardently dedicate themselves to Eucharistic adoration. By this means, the Knight enjoys an intimate friendship with the Person of Jesus, and he profits from an increase of faith, hope, and charity. In Eucharistic adoration and above all in Holy Communion, the Knight finds the strength to confront all the difficulties of life. Each Knight is to fervently adore the Body of Our Lord Jesus Christ outside the Mass, so that in intimate conviviality with Him they may progress in the cultivation of the theological virtues, forming the necessary dispositions to participate devoutly in the memorial of the Lord and receive Him with benefit. Seeking to foster devotion to Our Lord in the Most Blessed Sacrament, the Knight provides an example of reverence and devotion both in serving at the altar and in his daily hours of adoration. Although other pressing duties and scheduled activities may at times call him away from the chapel during his allotted time of adoration, each Knight is asked to spend at least one complete hour before Our Eucharistic King each day. Each Knight is to ask the intercession of Our Lady to worthily adore Jesus in the Blessed Sacrament. The assiduous and recollect reading of the Sacred Scriptures, the strength of God for the salvation of those who believe, should be a much-esteemed occupation. Special preference should be given to the New Testament because it contains the principal testimony of the life and the doctrine of Jesus Christ. The Knights are to participate in communal recitation of Evening Prayer of the Liturgy of the Hours. Renew the Consecration to Our Lady composed by St. Louis Marie Grignion de Montfort. Except when a Knight is ill, he should always say the Consecration while kneeling before the Blessed Sacrament or an image of Our Lady. “We use the talents we possess to the best of our ability and leave the results to God. We are at peace in the knowledge that He is pleased with our efforts and that His Providence will take care of the fruit of those efforts.” — Mother Mary Angelica, P.C.P.A. 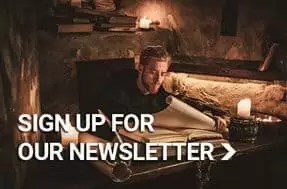 Knights are to pray before and after meals. The Knight of the Holy Eucharist strives to maintain a wholesome asceticism, which includes simplicity in his meals and fasting and abstinence on Fridays according to the laws of the Church and the discipline of the community. “Holiness is a beautiful struggle.” — Mother Mary Angelica, P.C.P.A. Recreation is often looked upon as a waste of time, even by those who are spiritual Yet the prudent know that the spirit, like the body, has requirements that when sensibly met, fit it for better service to higher ends. Beyond its practical benefits, recreation also has a higher significance. It is a reminder that ends surpass the means, that when the toil of this life has passed, an Eternal Day of rejoicing will dawn. On that great Day, the contemplation of God above all will be our happiness, but not lacking will be the fellowship of the saints, the unearthly delights of a glorified body, and a host of inconceivable enjoyments which have yet to enter the heart of man. Times of recreation, then, are not divorced from the spiritual life. They are spent in God’s presence and directed to His service. For all time is His. “To be able to say yes to God at every moment of our lives is the essence of holiness. It really doesn’t matter whether you are at prayer, whether you are working, whether you’re recreating, whether you’re eating or sleeping—nothing should separate you from Jesus.” — Mother Mary Angelica, P.C.P.A. As established by St. Ignatius of Loyola in his renowned Spiritual Exercises, the practice of the examination of conscience is commendable. It is advisable to make this examination of conscience daily before night prayers. In the houses of community life, it is appropriate to observe a period of “Great Silence” at night during which all conversations should be avoided. According to this spirit, the Knight is encouraged not even to communicate through gestures during this period, and he should avoid all hurried movements or other acts that cause noise, such as slamming doors. Singing, humming, whistling, “conversing” through signs, mimicking and drawing pictures in the air with one’s hands are attitudes incompatible with the serious intention to observe silence. To begin the “Great Silence,” it is a good practice to pray the Litany of the Blessed Virgin Mary and/or sing the Salve Regina. The period of silence begins at 9:30 p.m. and lasts until the conclusion of Morning prayer. Visit the Blessed Sacrament before retiring in the evening. “Silence is not something that you can impose from the outside in. It’s something that’s inside, and it must grow and be concentrated. Without it you cannot achieve holiness, because you cannot hear God, and neither can you speak to Him.” — Mother Mary Angelica, P.C.P.A. When going to bed at night, place Rosary in an appropriate pocket of the clothes; if there are no pockets, it can be worn or held. At this time, the Knight is to be in his room with his lights out. “Before you go to bed, examine your conscience a little bit and ask yourself if you were like Jesus today.” — Mother Mary Angelica, P.C.P.A. “We are all called to be great saints. Don’t miss the opportunity!” — Mother Mary Angelica, P.C.P.A.